As ISIS continues to be removed from key areas in Iraq, plans to address rehabilitation and reconciliation are being formed by governments, NGOs, political groups and religious leaders. The Christians of northern Iraq have been victims of historic violence, but have also worked to foster peace and forgiveness in the region. They therefore have a critical role to play as bridge builders in this difficult process of creating reconciliation after ISIS. 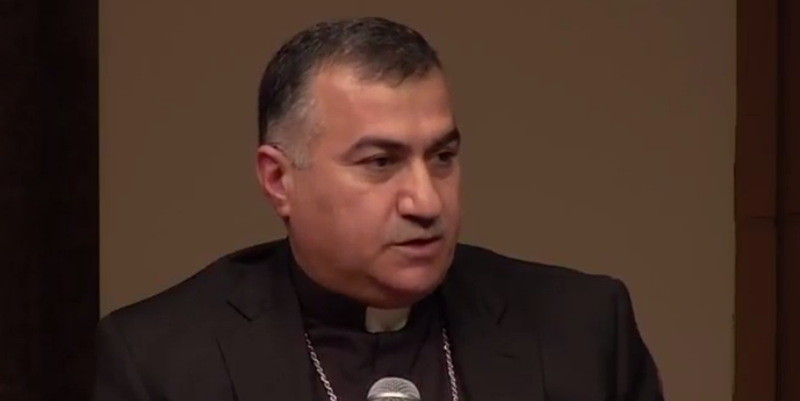 Chaldean Catholic Archbishop of Erbil, His Excellency Archbishop Bashar M. Warda, CSsR, has held overall responsibility for the welfare of the majority of the displaced Christians in northern Iraq since August 2014. He will draw on this deep experience to share his views on the role for Christians in post-ISIS Iraq and how cycles of violence among all groups in Iraq can be ended. Archbishop Bashar Matti Warda, CSsR, is the Chaldean Catholic Archbishop of Erbil in the Kurdistan region of northern Iraq. A leading international voice for the persecuted Christians in the region, the Archbishop’s responsibilities extend beyond his normal peacetime pastoral duties. As de facto chief administrator for the welfare of the displaced Christians of Mosul and Nineveh Plain, as well as the pastoral leader of his existing Archdiocese, his work includes oversight of food, housing, education and pastoral care for nearly 20,000 threatened families. To watch the entire lecture and Q&A from October 27, 2016, click here. Watch: Does Your Food Taste Better if You Post About it On Social Media?